I’ve never tried this chicken before. I usually food prep on the weekends to save time during the week. Or I cook in bulk and freeze for easy leftovers. Your dinner looks delicious! This looks really good! 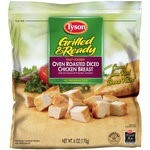 I wasn’t aware of this product from Tyson, but it looks like it would save so much time for dinners. Now I need to make a one-pot dinner! great idea! i love one pot dinners!